This is a transcript of Alison Price being interviewed. Alison Price, moved to Vancouver in September 2012, and attended the Guild the first time, just in time for our AGM in October. Long story short, she was elected president for the group. Alison and I chatted both on the phone and via email about who she is and what she loves about being a professional astrologer. To begin with, Alison is a double Leo with a Scorpio Moon, and like every Leo knew her Sun sign early. Her favourite topic in astrology is children’s charts; parents come to her to find out what educational route would suit their child the best. Along the way another major group of clients were women seeking advice about conception and fertility. As a rule, Alison, stated she was their last resort after having exhausted the main stream medical advice. That part of her practice began to grow exponentially about a decade ago, so she decided that she needed to find the tools to help her clients. During our conversation it became apparent, that the reason she continues to work as an astrologer is because she firmly believes astrology can help her clients lead the life they were mean to have opposed to the one others around them expect them to lead. Anne: How did astrology become your career? Alison: My interest in astrology was piqued when I was at school in a dry and dusty geography class we were working on the solar system and the teacher alluded to the influences the planets have on each of us and through a reading she did of the sun signs from an astrology book she had. ctly as my sun sign had depicted and I began reading more on the subject. I took my first astrology class at the age of twenty and that was it, I was hooked on astrology, and have not looked back. I began reading for friends and family and then had to slake my thirst for understanding by challenging myself to interpret for other, strangers and people referred to me by those who knew me. My first astrology teacher always said “Don’t give it away, take compensation for every reading, even if it is a cup of coffee. If you don’t value your work no one else will either.” that is how I started professionally and it grew from there. Anne: Why do you keep at it? 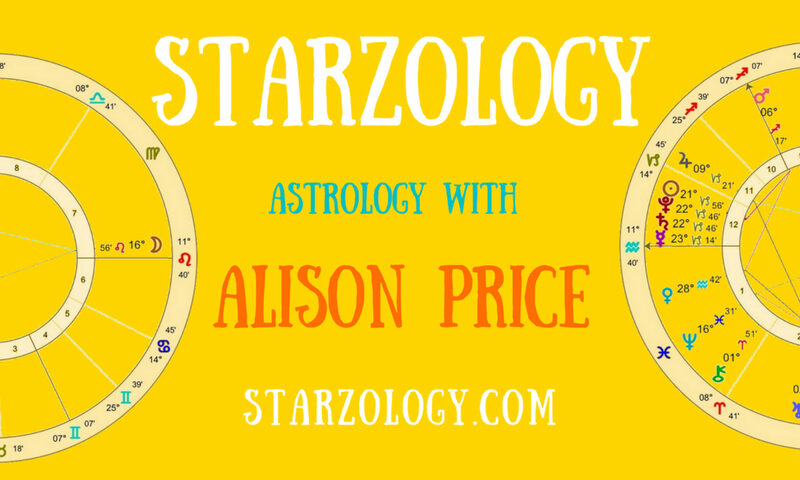 Alison: For me astrology is an all encompassing subject that permeates my life. I love the patterns formed in the chart by the aspects and the complexities that form which are different for each person. I believe I can help people see their potentials and find the path in their lives that their chart is showing. If you are true to you natal chart potential you are living a fuller and more satisfying life. Most of my clients are forty plus women who have reached a crossroads either because the kids have left home or their partner has moved on for whatever reason. Women at this stage are after asking themselves “Is that it? Is there nothing more to my life?” and it is at this point that they find me. We explore what they really should be doing instead of spending all their days working for someone else, cooking and cleaning and just being “Mum” to young people who clearly can stand on their own feet. Women at this stage of their lives are at a turning point and it is important that they stand facing the right way so as to get the most from their lives. It is my job to show them options and possibilities displayed in their chart. Anne: What’s most rewarding about being an astrologer? Alison: I believe the best thing about being an astrologer occurs when clients and students get it. When they begin too see other possibilities (as shown by their chart) that they may not have considered about their lives. This often results in them finding a creative path in their life that transcends the day-to-day grind on which many folk are trapped. Astrology offers possibilities for exploration of talents and interests in each natal chart that if the person takes these roads it will result in him or her having a satisfied life, because they are living their life in line with their birth chart. Anne: What fascinates you the most? Alison: I like the visual image that the chart presents with all the aspect lines and the weighting of the chart by planet position in the quadrants. I always use full color charts and I spend quite a bit of time simply meditating on the client’s natal chart image. I find the circle or wheel of the chart is almost like a mandala for contemplation. Anne: What do you find are the challenges to doing astrology full-time/for a living? Alison: By far and away time management is the most challenging thing about doing astrology full time. Each client requires intensive chart preparation work and time for a thorough understanding of the message in the chart. I also need to pause for reflection before I consult with my clients. At the same time I like to keep up with current astrological thinking and I try to read all the trade periodicals and eNewsletters each issue. I also buy at least one new astrology book every month. Anne: How has learning about your chart changed/improved your life? Alison: I would like to say that it has given me a better understanding of humanity and of the varied people out there. To some extent it has been a humbling experience. I grew up in a family dominated by Pisces parents and siblings. I think they were overwhelmed by my outgoing nature and found me difficult to understand. Leo is not necessarily bossy but they simply want to inspire others, and if that means suggesting ways that friends or family can improve their attitudes and life path then Leo will tell them. It can come over as dictatorial but that is not the true drive for Leo as they do not want to lead but to organize others. My chart sports a Leo ascendant, Mercury, Uranus and Sun. So what you see is what you get. I also have three planets in Scorpio and this influence in my chart expresses itself in my life by allowing me to understand my clients and their deeper and darker motivations. Anne: What do you find is the most challenging aspect in your chart? Alison: I had to give this some thought, but I think it is the Sun conjoined Uranus less than one degree but not partile. This conjunction in my first house gives others the impression I am unpredictable and don’t fit in (as an astrologer this is par for the course) but is also is reflected in my immigrant status that I have had most of my life. Probably the most challenging part of my chart is the perception others have of Leo’s in general, and that the solar ruled are immediately pigeonholed into the drama queen slot and a “Let them eat cake” attitude in the vein of Marie Antoinette. There was an article in TMA last year titled “The Offstage Leo” which thoroughly explores the Lion’s sign and promotes a better understanding by the other signs. Anne: Why did you choose conception charts as your presentation for the Guild? Alison: My interest in conception astrology grew slowly over the years. Twenty years ago you never heard of these requests and even ten years ago they were few and far between. Over the past decade I have been approached by many clients who were struggling to fall pregnant. This was often the first pregnancy and sometimes they wanted to have a second child. It was a side of my business that grew from a need (women wanting to conceive) that need filling (conception astrology reports). I began to help a few women here and there but then it blossomed to become a good quarter of my practice. Because you don’t need to meet the client face-to-face it is a great product to have as an online service. Now the majority of my conception clients do not reside in Canada but are spread through the world. Bear in mind that conception astrology is a very private thing indeed. Many of my female clients do not let their husbands know of the consultation either. Alison: I do a lot of work with children’s astrology. The parent starts out as my client for a general astrology consultation and then moves onto their child’s charts. It often starts at the birth of a new born and grows with the child. My particular interest group is in the elementary school age group which is astrologically after the transiting Saturn opening square but before the opposition. This group of children are also before their first Jupiter return. Children in this special range are usually in grades one to eight. They are learning fine and gross motor skills and especially the three R’s reading, writing and arithmetic. It is a time when basic learning skills are gained. Almost as if they are learning how to learn, for later. Difficulties usually appear if the teacher calls the parents in because their child is struggling in class. Astrologically it is often found to be a progressed Mercury stationing retrograde thus creating a year or two of lack of academic progress. For a child’s consultation I consider the whole chart of course, but more often than not Mercury (the planet of learning and early school) is debilitated in some way. Providing the parents with a heads up about possible difficult school years for their child is a valuable benefit of children’s astrology. Being forewarned is forearmed. Taking action to help their child with perhaps remedial classes of engaging a math tutor after school can help the youngster. It is important that children in this age group move forward with their learning in elementary school and do not slip through the cracks. Anne: What type of astrology do you do and why? Alison: Having explored different types of astrology Vedic, Chinese, Sidereal and Uranian etc. I have settled western tropical astrology. I use both traditional and modern rulers for the signs such as Mars and Pluto for Scorpio as I believe the signs with two rulers (Scorpio, Aquarius and Pisces) work on two levels. Regarding a Dispositor Tree I always use traditional rulers so Mars rules Scorpio. This came in to play when Pluto transited Scorpio from 1984 to 1995 and it became apparent that during that ten year period only Pluto could ever become the Final Dispositor of any person born during that generation. My children were born at this time so I was closely watching charts for newborns then. To my mind this was not true (that Pluto could be the only Final Dispositor) and I went back to traditional rulers during that period and discovered that it works much better than using modern rulers when constructing a Dispositor Tree. I call myself a psychological astrologer as that is how I see the benefit I offer to my clients and students. I love Placidus house cusps and I keep tight orbs and I never allow planets on house cusps to creep into the next house. Anne:Why do you like Placidus? Alison: I use Placidus houses firstly because I learned this system initially and secondly because it fits my own chart better. Placidus places Jupiter in my fifth house and I see that as exploration of both children’s and conception astrology and both are fifth house areas of life. If Jupiter was in my fourth house it would incline to a large home and family and this is not the case in my life. On a research note, I have invested much of my time and effort studying The Oriental Planet and I have a book manuscript in the pipeline which may see the light of day later this year. With oriental planet research I have looked at all the planets and I am now even exploring Eris for those of you who are Aries or Taurus Sun signs. Anne: Your oriental planet is Mercury from the classical perspective and Uranus from a contemporary one, so which one do you identify with? Why is the planet significant? What would you state about your oriental planet? Alison: My oriental planet is Uranus. The oriental planet is a significator of two things; your vocational inclination and how you are announced. Your vocation is defined as what you would do if you did not have to work. This is different than your job (6th house) and your career (10th house). Particularity in the vocation area my original research has shown that your oriental planet makes a Ptolemaic aspect to other planets that indicate you vocation. This shows up as, for instance, all famous composers have Neptune (music) in aspect to their oriental planet and all full-time and well known astrologers having Uranus (astrology) aspecting their oriental planet. This is over and above the average for aspects in general. How you are announced is shown by your oriental planet as it is the harbinger of the Sun. It rises before the Sun on your birthday and announces the main act, you. For example, with Uranus oriental people say “she’s an astrologer, she’s an immigrant and she is different” because Uranus announces me. It is what people say about you before you enter a room. Conversely the occidental planet, the planet that sets after the Sun on your birthday, shows what people say about you after you have left a room. It is your lasting impression so perhaps that is something to think about. Thank you for taking the time out of your busy schedule to work on this chat, and let’s hope you will put your research topic on our speaker schedule in the next year or two. Previous PostPrevious Born on the cusp? Don’t know your sign? I can help.